The instruments on board the Cassini spacecraft have observed an enormous storm raging in the atmosphere above Saturn's south pole. This type and scale of storm has never before been seen on another planet. Images of the storm show it to be very similar in morphology to hurricanes on Earth, with a well-developed eye some 1500 km across, surrounded by a ~300 km wide ring of towering clouds. From the central ring, two spiral arms of clouds extend outwards and the entire storm measures ~8000 km across. 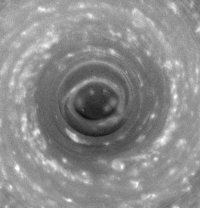 Description: Wide-angle camera image of Saturn's south polar storm. The image has been contrast enhanced and re-projected to show the planet from a perspective directly over the south pole. By analysing images of the storm taken with different Sun illumination angles, the height of the clouds relative to the central eye can be estimated. The clouds were found to tower 30-75 km above those in the centre, which is much higher than the ~15 km in similar storms on Earth. The south polar area has been observed at different wavelengths in the visual and infrared by Cassini's Imaging Science Subsystem (ISS) and the Visual and Infrared Mapping Spectrometer (VIMS). In the below set of 6 images, the ISS images are in greyscale and the VIMS images in false-colour. Description: South polar storm imaged at 6 wavelengths (left to right, top to bottom): 460 nm, 752 nm, 728 nm, 890 nm, 2.8 μm, 5.0 μm. The absence of high clouds is also underlined by the brightness of the eye in the last image at 5.0 μm (with red colour scheme). At 5 μm, the lack of clouds at higher altitudes allows for the planet's thermal emission from below to escape, making the region appear brighter. The dark spots in the two VIMS images are all smaller storms that are well developed and extend deep into the atmosphere, making them good absorbers of the thermal emission from the planet below. They therefore stand out in silhouette. 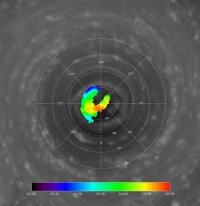 Observations by the Composite Infrared Spectrometer (CIRS) taken at the same time, but imaging higer altitudes, reveal a very small hot spot over the south pole coinciding with the eye of the storm. Description: Temperature measurements, colour coded and plotted over an ISS wide-angle camera image of the south pole at 752 nm. The temperature ranges from 162 (black) to 165 Kelvin (red). The hot spot is clearly visible. The measured temperature increase of ~2 Kelvin suggests that the atmosphere sinks over the south pole, with the increase in pressure causing the atmosphere to become compressed and heated up. The two VIMS images show the large number (hundreds) of smaller storms over the entire south polar region. This indicates the sheer extent of convective activity in the atmosphere there. It is expected that the fact it is currently summer on Saturn's southern hemisphere plays a role. Follow-up observations over the next few years will help shed more light on the impact of the seasons on the convective activity at the south pole.